Sunday, February 21, 2010: Reluctantly, we leave Las Vegas and the kids. Had a great visit but it’s time to mosey on down the road. 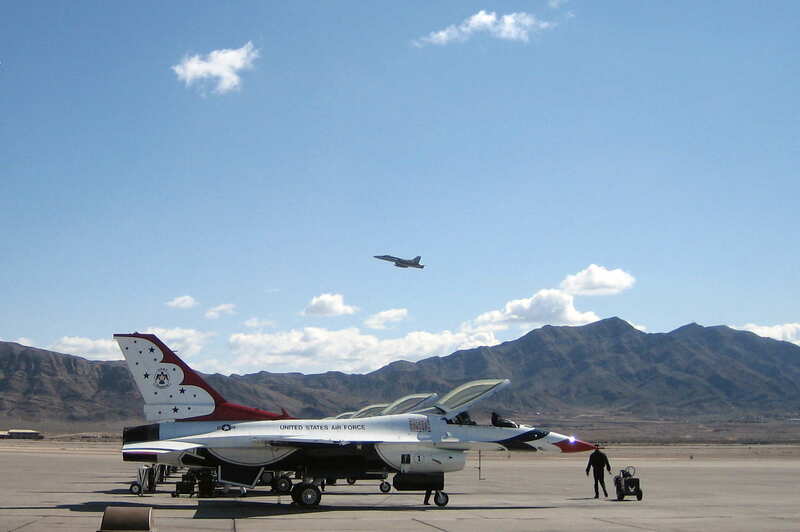 We decided to make a stop at Nellis Air Force Base and stay at their campground in order to dump tanks and re-supply at the exchange and commissary. Driving in we were greeted by a “Welcome Race Fans” banner and a very crowded park. As it turned out there was a big NASCAR race coming up and all the race fans had pulled in as the Las Vegas Motor Speedway is right next door to the base. We were able to get a spot in overflow which suited us just fine as we were only going to stay for two nights. Imagine our surprise when a couple we had met while in San Diego at Admiral Baker Field campground were right next door to us. 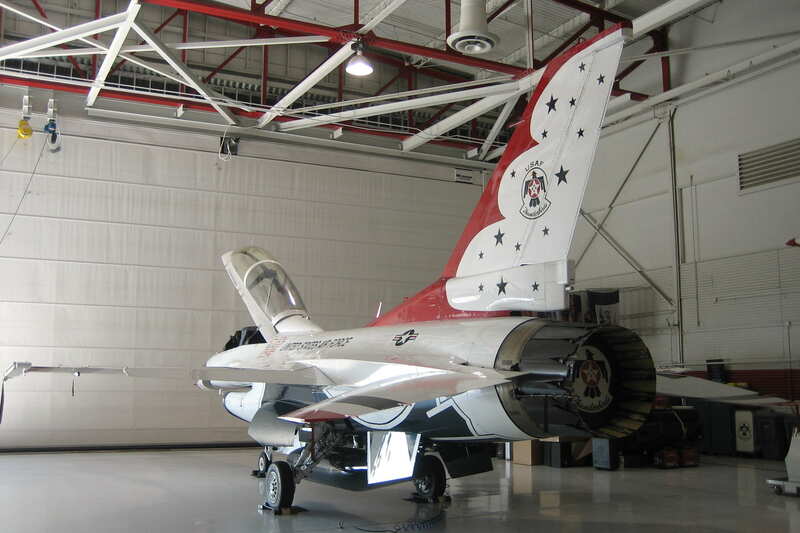 Monday, February 22, 2010: Kit had an appointment at the base beauty shop so I decided to visit the USAF Flight Demonstration Team “The Thunderbirds” as their hanger was open for tours today. I was escorted by a nice female staff sergeant who had just been assigned to the team and part of her 21 day indoctrination was giving tours. 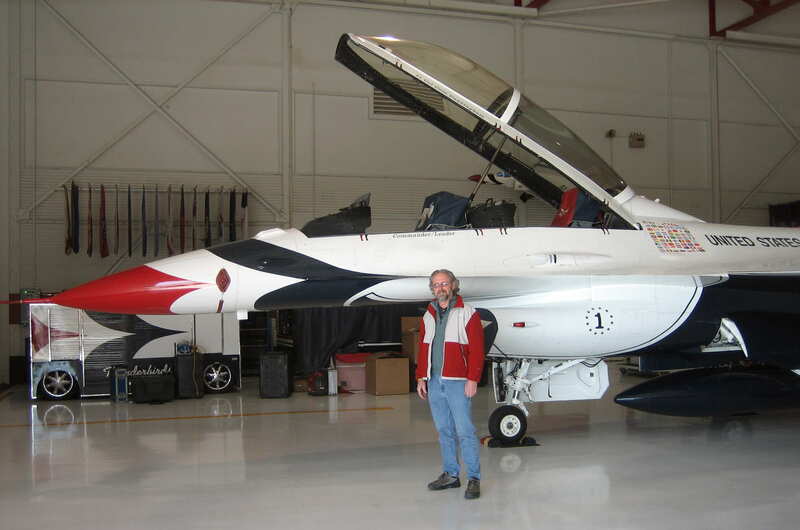 I was allowed into the maintenance hanger where the crews were getting their F-16 Fighting Falcons ready for the upcoming show season. Leaving the hanger I drove along the flight line where I saw some F-15 Eagles painted up to look like Russian planes. However, they weren’t rushing anywhere…..just sitting there on the tarmac. As it turned out they were part of the “Aggressor Squadron” that participates in air to air combat training against the US Air Force’s F-22 Raptor (a fine Lockheed Martin product) Fighter aircraft. Poking around further I noticed a very large solar array system. 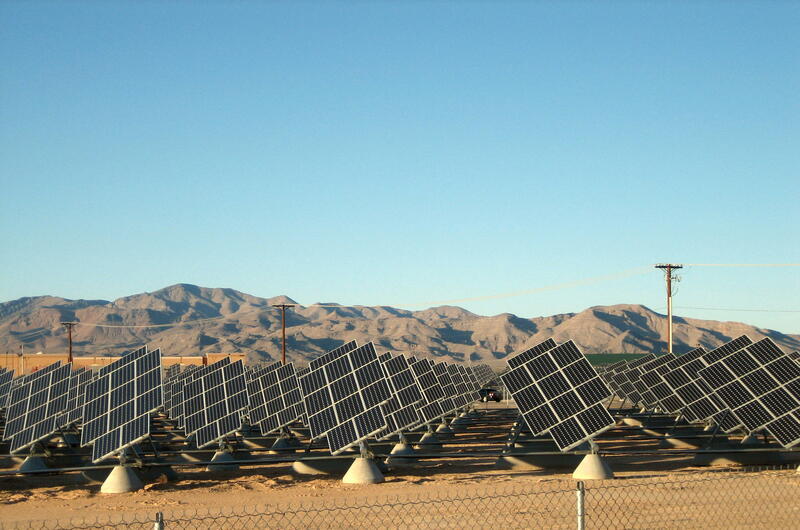 I then learned that Nellis Air Force Base powers one quarter of its installation by solar power. The Solar Farm consists of 140 acres of land covered by 70,000 solar panels, each capable of independently tracking the sun. The system in full operation can generate 14,000,0000 watts of power. Pretty impressive. Back at our campsite we had dinner and took a walk around to take inventory of the many states represented by campers…..a frequent evening activity of ours. I know…..we are certainly a wild and crazy couple. However, not another New Englander in the bunch! I guess most New England Snowbirds still follow the law that says they must go to Florida for the winter. Tuesday, February 23, 2010: Underway early for points southeast. It is 54 degrees and sunny….perfect traveling weather. 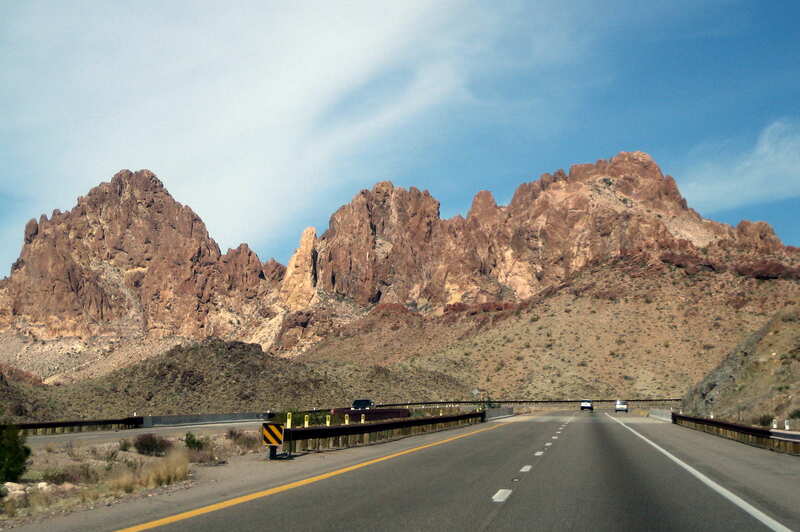 Normally we would head to Boulder City and cross the Colorado River passing over the Hoover Dam. However since 9/11, trucks, buses and RV’s are prohibited from crossing the dam. The government is building a ginormis bridge up river but it will not be finished until later this year. 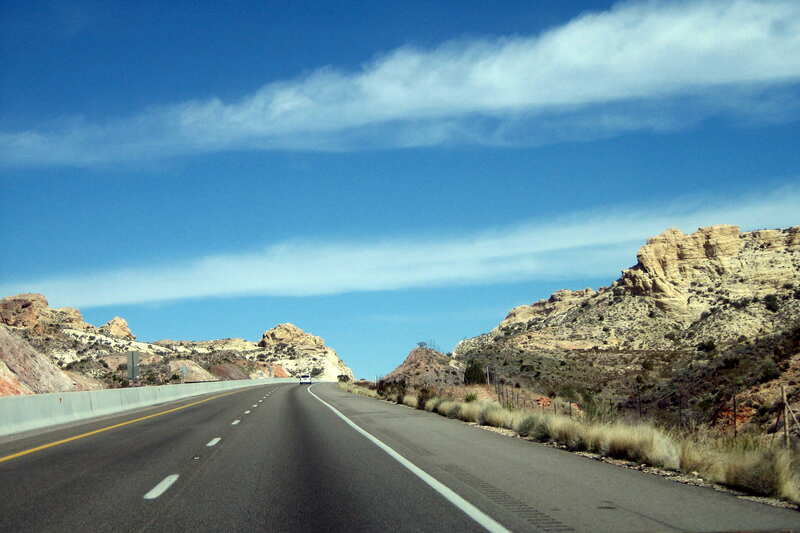 So we jumped on US-95 then US-163 toward Laughlin, Nevada. 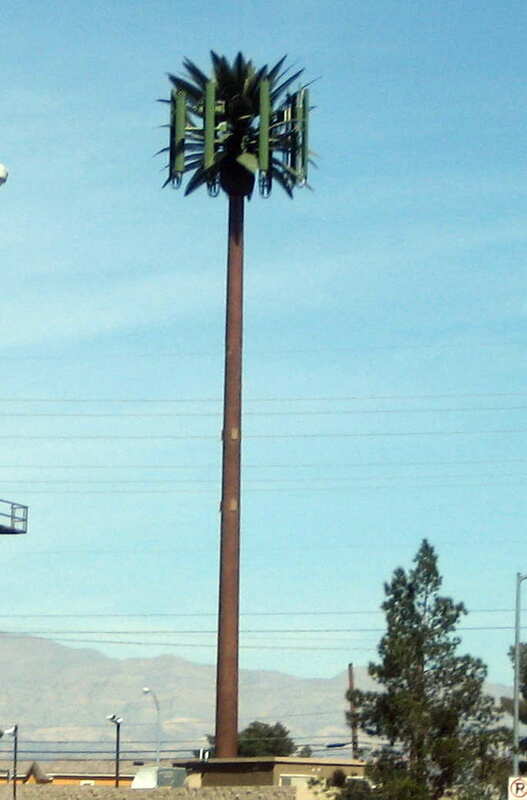 Not much of interest along this stretch however as we left the city of Las Vegas we did see another one of those camouflaged cell phone towers. This one was dressed up as a palm tree…..a bit more appropriate for a desert environment. Gee….you can hardly notice it. We crossed into Arizona and headed east on US-93 through Wickenburg and then took US-60 around Phoenix toward Apache Junction. The scenery did get a bit more interesting in these parts. We stopped in Apache Junction to get fuel, lunch and pick up some DayQuil/NightQuil for Kit…..It appears she is coming down with a bit of a cold. Hope it doesn’t develop into anything worse. Leaving Apache Junction we took US-88 (also called The Apache Trail) up into the Tonto National Forest toward Tortilla Flat. I find it kinda odd that Tonto got a whole national forest named after him and the Lone Ranger…..Nada! Maybe he wasn’t such a Kemo Sabe after all. 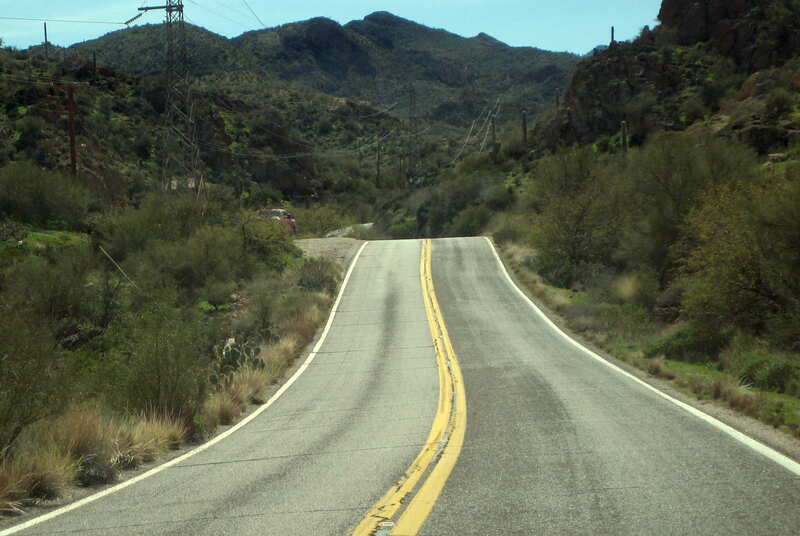 The Apache Trail was built in 1904 along an old Indian trail (Apache Tribe, I think). It was then improved into a “haul road” during the construction of the Roosevelt Dam which now impounds the upper Salt River valley creating, appropriately enough, Roosevelt Lake. After navigating the steep and winding road we finally arrived at Tortilla Campground late in the day. Fortunately, my “bruzzin” Dewey (remember Dewey?) was already there and had saved us a nice camp spot right next to his rig. 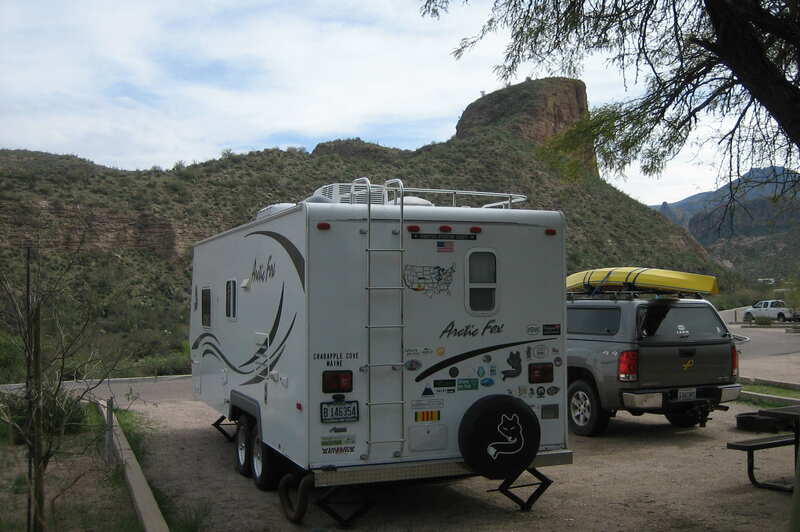 The campground is very nice and sits on a tributary to the Salt River and in the shadow of the Superstition Mountains. 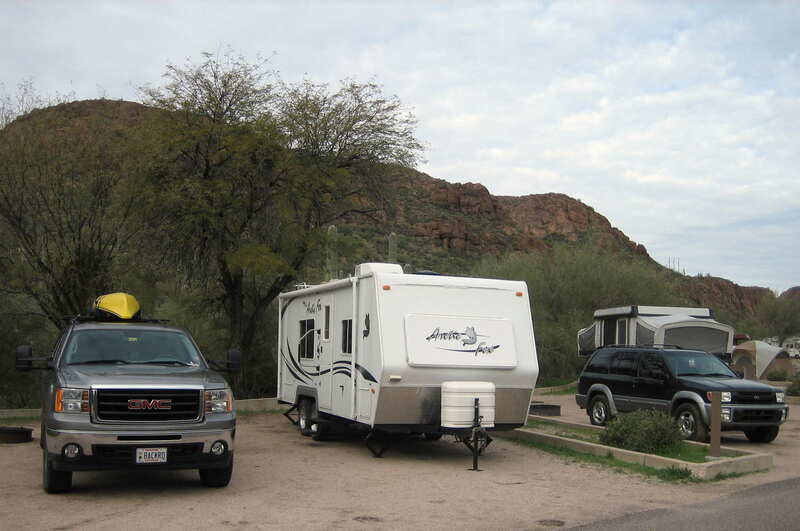 Kit’s Corner: This was quite a nice campground. We had a great site and the weather was perfect. Since the guys had some hiking and kayaking in mind, I decided to take a couple of days just having some quiet time to read and/or nap. As luck would have it, I picked up a bit of a cold the last couple of days in Las Vegas which developed into lots of coughing. So, with my heavy duty cough syrup, I managed to nap most of the time at this campground and just hang out during our entire time there. We had no cell or internet service so things worked out just fine…. This is a amazing site post, im ecstatic I stumbled upon it. Ill be back again in the future to check out other posts that you have on your blog.